I have seen a plant at the Toronto Botanical Gardens that I have been searching for 4 years. I am hoping you can identify it from the pictures attacht. It is a grass with an small interesting triangular seed pod. 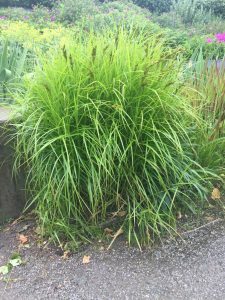 The plant in your photo is a Carex, commonly known as a Sedge. This particular plant is a self-sown specimen, possibly Carex muskingumensis. The parent may be the Carex muskingumensis ‘Oehme’, commonly known as Palm Sedge, in the perennial border at the Toronto Botanical Garden. It has a thin gold edge on the foliage. We hope that this is helpful. Thank you for contacting the Toronto Master Gardeners.